Spring is here and it always feels like the perfect time to have a bit of a clear out. I have been staring at all my winter clothes thinking, ‘I need to get the summer stuff back out’, the weather here has been delightful and summer is well and truly on the way and my flip flops are calling. It’s not just our clothes and our houses that can do with a Spring Clean, but it’s also the time when we look at that summer wardrobe and feel inspired to ramp up our training and lighten up our diets. In Chinese medicine, springtime is the time of the liver and why in a lot of cleanse protocols liver tonics and herbs are popular, such as dandelion and milk thistle. So if you are feeling motivated right now, ride on that feeling and really go with it. Doing a spring time cleanse is a great way to kick start again this season. This is NOT about crash dieting. The body does not respond well to yo-yo dieting and the end result will actually cause you to store more body fat. Through a effective cleansing process you want to be sure that you are giving you body what it needs but allow it some time to de-load and actually heal it’s self. I usually aim to cleanse about once a quarter and never more than for 7 days. Always focus on using a whole food approach, that means eating real foods, so that these can become new health habits that you can integrate into your normal life to experience more health, more energy and more control over your eating. So here are some base guidelines for you if you want to cleanse your body this spring. I always advise a 7-day period where we de-load the body and ramp up the nutrients to support the process. Keep it simple – Removing any processed foods, as they are usually low in nutrients and high in fat and carbohydrates. Instead go for foods that are as nature intended, grown from the ground. I would also recommend staying off red meat for the duration of a cleanse too. You will also start to re-train your taste buds and after the 7 days of quite plain foods they will appreciate every flavour that comes your way. I Do use a vegan protein shake during this time to access nutrients and protein with more ease. Avoid snacking – Every time you eat, you are giving the body and your digestive system a job to do. During a cleanse we want to give the body a little bit of a break, think of it as giving your body some much needed annual leave. Ok it still has to do a little work but you are giving it the easy job for this week so stick to 3 meals a day. Hydration – When your body is working effectively it flows. Imagine body fluid as thick and sludgy, well that is exactly how your body will feel when you are not adequately hydrated. A light and free flowing body fluid is what happens when your body is hydrated. Your body works as it’s supposed to, effectively being able to remove toxicity out of the body. Move – Going hand in hand with hydration, if your body is moving you help to pump the blood around the body and again moves toxicity out of the body. Aim to move every day, even if it’s just getting out and going for a walk. Avoid – Sugar, Alcohol, Coffee, Dairy, gluten/wheat-based foods such as bread, pasta and processed foods. These foods are taxing on the body and are common triggers for inflammation. Remember a cleanse is just for a short period, I recommend no more than 7 days. It doesn’t mean you can’t ever eat these foods again. You can add them back in but you will then have a greater awareness of how your body responds to them, and your taste for them will likely change too. If you want to jump on my Ultimate Spring Cleanse which will be launching from next Monday and will be available for the duration of April. 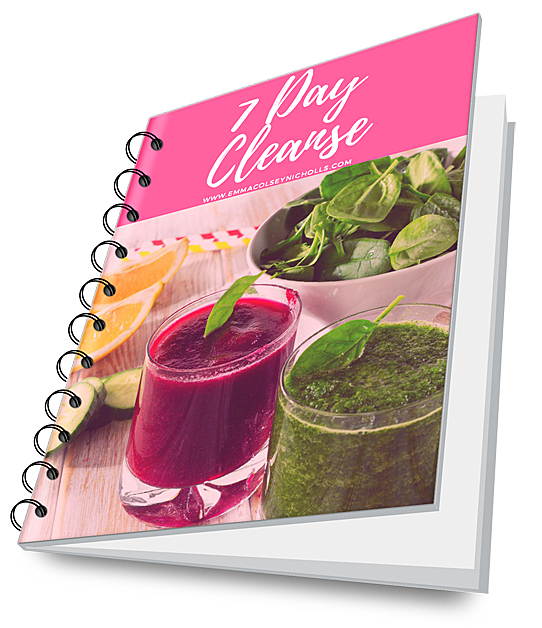 You will get full step-by-step guide with recipes and protocols to a full 7 day cleanse with success to kick-start your winter weight loss and boost your health with full support thorought and how to follow on your cleanse for maximum benefits.